Offered by US based London Connection. 2 Bedrooms, 2 Baths. A beautiful property! Clear your credit cards if you are staying in this exclusive district of London. Harrods is two blocks away and all the shops along Beauchamp Place just around the corner! Yet, while in the midst of all this luxury and temptation, we offer a wonderful property which is hidden away in a quiet cul-du-sac of wonderful mid-Victorian residences. The large trees allow further peace and quiet. It is absolutely a beautiful area and a fantastic destination for a visitor to London. The Knightsbridge Tube Stop on the Piccadilly Line is one of the most desirable travel destinations in the city and takes a visitor to Green Park, Piccadilly, and straight through central London. The property itself is on the raised ground level with a few steps leading into the building itself. On the raised ground floor, the door to the property is directly off the security controlled main entrance hall--all very convenient and easy to reach. 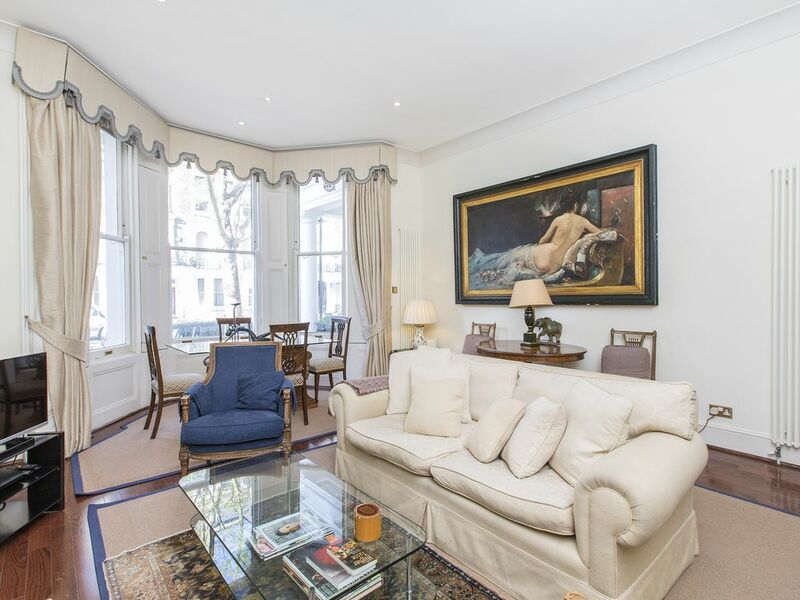 The beautiful LIVING ROOM is filled with beautiful decorative items brought here from the family's home on Eaton Square. There is a DINING AREA for six people in the bay window and comfortable seating throughout the room. A decorative fireplace is the focal point of the room with rare Louis XVI chairs. All the needle work along the walls was done by family members. The KITCHEN is accessed through French doors at one end of the lounge. The very nice kitchen has all machines including washer/dryer, dishwasher, fridge/freezer, oven/stove, granite countertops, microwave, etc. It is really fine quality and finished in hardwood floors throughout. The MASTER BEDROOM has a UK KING size bed and wonderful closets. The master bedroom is made further comfortable with an EN SUITE BATHROOM with an excellent shower stall. The SECOND BEDROOM has two single beds and has its own EN SUITE BATHROOM with shower stall, sink, and loo. The bedrooms and bathrooms are outstanding. This is a beautiful flat and comfortable for four persons. Gorgeous property. Properties of this standard in this location are not readily available. This is an unusual and wonderful opportunity. High speed wireless interned is provided. Property is designated non-smoking.